An integral part of any restaurant is its customer service. It doesn’t matter how fabulous your restaurant décor is or how delicious your food is, if the service doesn’t meet or exceed customers’ expectations, there is a good chance they won’t come back. 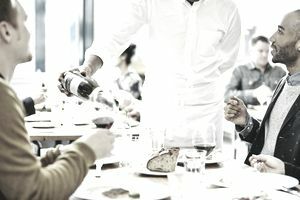 Customer service covers many different parts of a restaurant's day to day operations, going far beyond the front of the house staff. This is the golden rule of business. Even if you think the customer is wrong you never, ever, tell them that. Be understanding and empathetic and take the time to listen to their complaint or suggestion. Problems will inevitably arise in even the best of restaurants - it’s how you handle them that will determine if customer return or go elsewhere. While the front of the house is the face customers see, customer service includes everyone, from the maintenance crew to the cooks in the kitchen. Clean restrooms, good food, and a friendly and inviting atmosphere are all components of good customer service, in which every restaurant employee plays a role. If your restaurant takes reservations, be careful how close together you book them. Nothing will upset a customer like showing up for a 6 pm reservation and being told he’ll have to wait another 30 minutes. Restaurant reservations, when done correctly, allow you to spread out seating’s and keep the kitchen out of the weeds. When done poorly, reservations can result in a dining room filling up too quickly for the kitchen and not leaving any room for walk-ins. A good gauge of customer satisfaction is how well they tip at the end of a meal. A poor tip isn’t always a reflection on the server; it could be the food, timeliness of the meal, or other factors. Some restaurants choose to pool tips; others keep it separate among servers. For large parties or catered events, some gratuity is automatically added. Have a couple who dines with you every week? A bar patron who comes after work for a beer? Don’t be afraid to comp a few meals or beverages for your regular customers. This shows them that you appreciate their business. How was everything? Any server worth their salt will ask this at least once during a meal. But not every customer feels comfortable complaining verbally if something is wrong. Offering a customer comment card at the end of a meal is an opportunity to gain valuable feedback, both positive and negative, about your restaurant. While it’s never fun to hear what people don’t like, comment cards give you an opportunity to make improvements. Occasionally you may have to deal with a customer who has had too much to drink or is in some other way acting out. Be sure you and your staff know how to effectively and safely deal with disruptive customers. One key strategy is to stop serving alcohol immediately if a person shows signs of intoxication. Social network sites like Facebook and Twitter offer an easy and free way to reach out to customers. You post daily and nightly specials on your wall, “like” customers status updates, and set up invites to restaurant events.